Free Wi-Fi an indoor pool and complimentary breakfast add up to a comfortable stay for our guests at the non-smoking Best Western of Hartland. All 60 rooms reached by exterior corridors at the two-story non-smoking hotel include free Wi-Fi cable TV with HBO mini-fridges coffeemakers and hairdryers. Mornings here start with a complimentary full breakfast. There's a heated indoor pool and conference facilities on-site. Parking is free and there is plenty of space for larger vehicles. 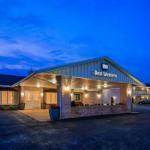 Set on M-59 and off I-23 in Hartland the Best Western is less than one mile from the Hartland Plaza Shopping Center. You'll find golf courses within four miles of the hotel and Kensington Metro Park and the Mt. Brighton Ski Area are both within 10 miles. The Palace of Auburn Hills is 24 miles away. Bishop International Airport is 20 miles away.